Two days after doing an interview with John Howe I went to see Cédric Cerf, the project coordinator of Saint-Ursanne La Fantastique. He works for Ursinia, who is the association who organises the John Howe 2007 event. For those who have no holidays booked yet, I would advise to got to Saint-Ursanne... I hope the following interview will once more show you why! Q. Could you tell us about Ursinia? Ursinia is the label for cultural events in the ‘Clos du Doubs’, the region around the town of St-Ursanne. The association aims at assisting, promoting and organizing different events. It was founded 8 years ago and since then has been responsible for most of the events taking place in the medieval town during the summer. Q. How did you come up with the idea to organize a Tolkien related event? One day an inhabitant of St-Ursanne happened upon an illustration by John Howe on the internet which depicted the old bridge at St-Ursanne. We contacted John and the project was born. Q. You are the Project coordinator of this event what does your job include? A little over a year ago I was asked whether I would manage and set up all the events for this summer connected with John Howe. My first task was to create a team and allot each team member his or her specific task. The main difficulty resulted from the difference inherent to the various events : we not only had to deal with art expositions, but also with outdoor sculptures, literary conferences, concerts, cinemas and a number of other events. Q. How did you get in contact with John Howe? Personally, I met John the first time last year. At that point a number of things had already been defined. Since then John has visited St-Ursanne on a regular basis nearly every Tuesday (he lives only an hour’s drive from our medieval town). Mainly we were in contact through the internet. A great thank you to our modern technology ! Q. How is it to have John Howe as artistic director? John is a very demanding person who likes to see things done well...just like me! He is a stickler for details and the whole programm offerred the public clearly bears his imprint. Q. Did John Howe also give advice for the concerts, movies and literature conferences? Or who created the program? John gave as a lot of good advice; the different themes and the persons to be invited for the literary conferences, the music groups and the films to be shown where all suggested by John. He endorsed all the events that we suggested. Q. Who came up with the name “Saint-Ursanne La Fantastique”? Q. The poster for the event is quit unique; can you tell us some more about it? John has already produced a great number of expositions throughout the world. In each case he requested the organizing committee to choose the subject for the poster from among one of his existing works. For the first time for this summer’s festival in St-Ursanne he created a new and original work since it is also the first time that his specific taste in music and such are presented to the public. It is, in fact, not « merely « and expositions of his works. Q. There was also made a limited lithograph of the poster, where can people obtain a copy? The illustration created specifically for this summer’s was reproduced as a lithograph in a limited, numbered and signed edition of 500 copies. 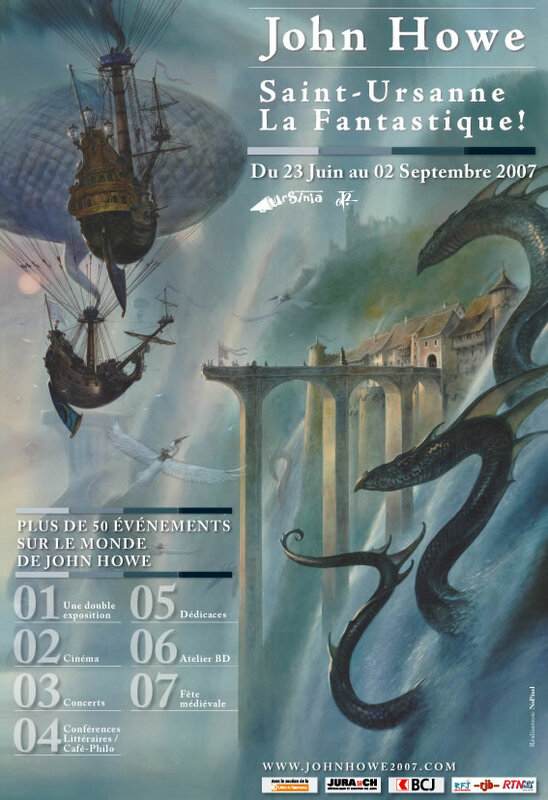 The public can obtain a copy either by purchasing it directly from the shop in the Cloister, or by ordering it online at our site www.johnhowe2007.com, « Practical Infos », « Shop ». It is sold at € 130.-. Q. What makes Saint-Ursanne so attractive for organizing events? St-Ursanne is a well preserved medieval town that has succeeded in keeping its middle-ages-touch. Although the resident population numbers not quite 700 people, most of them participate in one way or the other in the different events organized within the town. Within its walls it welcomes, for example, one round of the European Automobile Mountain Championship Race, an international piano festival and a bi-annual medieval festival which attracts 40’000 to 50’000 visitors during one weekend. Q. Saint-Ursanne is in many ways unique, could you tell us some more about this? 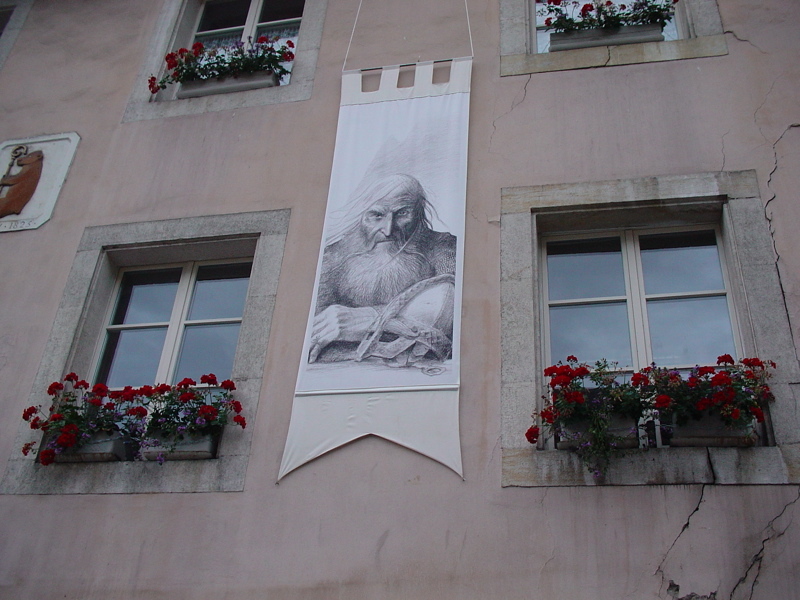 A visitor to St-Ursanne will perceive something very rare, a particularity that John Howe immediately recognized: there are only three gates leading into the town, and they were all built when the town itself was, several hundred years ago. Most old towns in Europe or elsewhere have sustained major alterations over the years. Not so St-Ursanne. 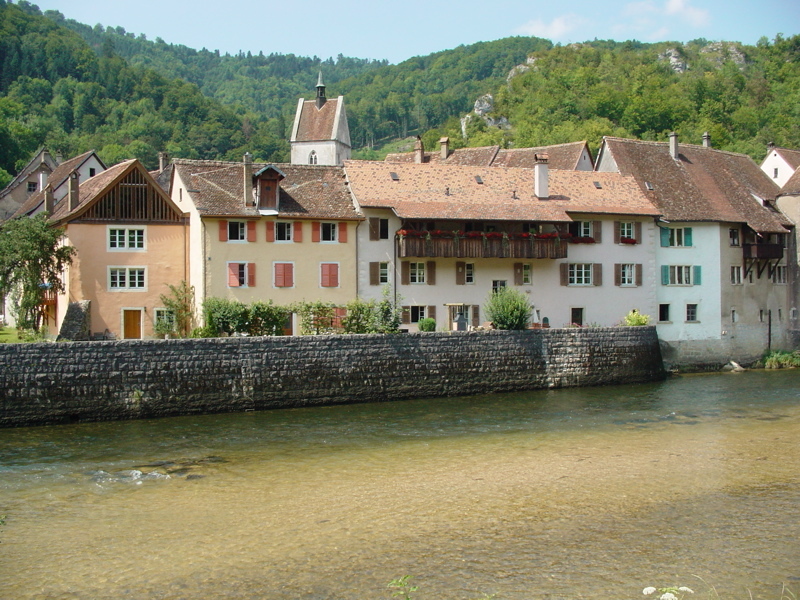 Another very pleasing factor is the river Doubs, which flows through St-Ursanne and is one of the few remaining hardly developed or channeled european rivers. Q. How many people where involved to get the outside settings ready? Numerous volunteers supported the two pillars, around whom centered the production of the outside sculptures : Michel Marchand, artist and painter at St-Ursanne and Marc Grélat, iron sculptor. Over thirty people lent a hand with one or the other sculpture, formed around a metal structure, covered first in hard foam, and then in plaster, and finally in a special weather-resistant paint. All the creatures are based on drawings by John. Q. Are you happy with the result so far? We are very happy. Several ten thousand people have already visited St-Ursanne during the summer which means we have made a great media impact and St-Ursanne has become much better known. This means much for the future and for the development of further events within the town, whose architecture is perfectly suited to organizing events such as the fantasy festival proposed this summer. Q. Now that the event is running would you do some things different next time? Organizing such events requires at least two years of hard work. Next time we will need to begin much earlier and we are already thinking ahead to the next similar event planned for the year 2010, with another theme and another artist. We will also need to work with a superior number of people and with professionals in order to present an even better event. This year can be considered a test run, an extremely useful experience for the future. Q. What are the most important days during the event still to come, which people should really attend? Until the end of the festival on September 2nd, we will propose two highlights. First, on Saturday, August 2nd the Irish Night with three groups at the Cultural Center in the former limekiln factory overlooking St-Ursanne, where visitors wil be able to dance till the wee hours. Then, on the last day of the exposition, on Sunday, September 2nd, visitors will have the opportunity to meet the two illustrators of the Lord of the Rings, John Howe and Alan Lee during a joint autograph session. It will be the first time in several years that the two artists are reunited. A must for every true Fantasy fan! Q. For people visiting Saint-Ursanne what advice can you give for accommodations? St-Ursanne is easily accessible; for example one can reach Basle by plane or railway and continue with a direct train connection which reaches St-Ursanne in 1 hour. For those arriving by car, St-Ursanne is reached by the motorway between Delémont and Porrentruy, exit St-Ursanne. From France by way of Belfort and Porrentruy. Q. What places besides Saint-Ursanne are really worth a visit? St-Ursanne is situated in the swiss canton Jura, only a few kilometers from the Franches-Montagnes (Free Mountains) plateau with its majestic firtrees and its wild ranging horses at an altitude of 1'000 metres. Walking or hiking along the river Doubs is also very pleasant, and the town of Porrentruy and the magnificent Réclère Caves are also worth a detour. Q. What will happen with the statues and the banners after the event? Formally, this has not been decided yet. However, one thing is certain: due to the historic character of the town, they will not be allowed to remain in place. We plan to offer both sculptures and banners for sale to the public, possibly through an auction. More precise information will briefly be available on our site. Q. Will any of the works or exhibitions remain in Saint-Ursanne? The spirit of it all will certainly linger on. It would indeed be nice if one or the other sculpture could remain as a sort of physical « trace » of this event. Maybe it will find its home at the Cultural Center in the former limekiln factory. Q. Are there already plans for future events, and will they be also Tolkien related? We have many ideas, none definite, however. We would like to organize an event similar in size in 2010, with expositions, installations, cinema, concerts and conferences, based on another theme and with another artist. It would also be wonderful to be able to offer each year a fantasy weekend or a whole week to keep the memory of this event alive. Q. One final question, can you tell in a few lines why people should really come to visit Saint-Ursanne La Fantastique. 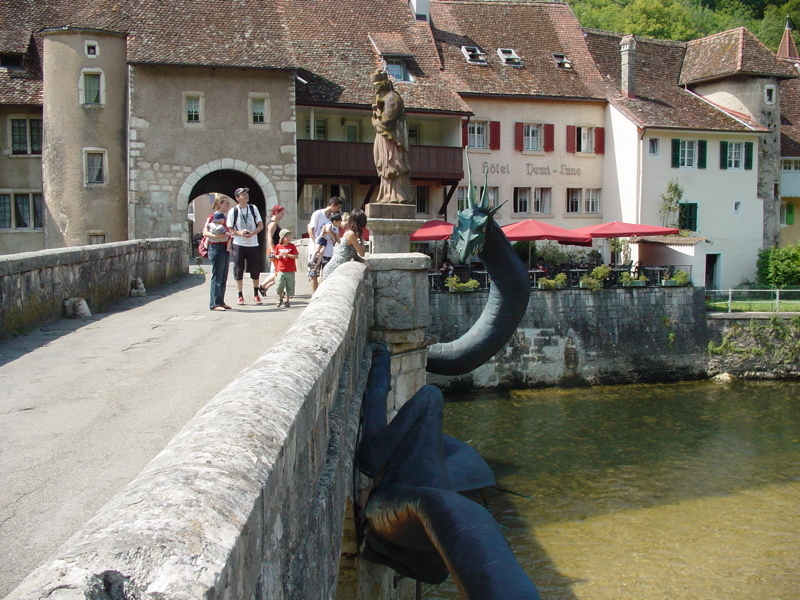 People should visit St-Ursanne la Fantastique for an enjoyable visit of the medieval town, for wonderfully calm and restful moments on the banks of the river Doubs and for an experience they will not find anywhere else, namely a town totally transformed to suit this theme. The event is quite unique and worth seeing.